I don't know about you, but after spending the past weeks learning about Kiddie Academy and their educationally focused daycare, I've been impressed. The work that they put in to providing only the highest quality care for the children that attend has made me want to applaude the business as a whole. There isn't a mom out there that doesn't want the very best care for her children! At the same time, I have found that the franchising opportunities with Kiddie Academy have been intriguing. Whether individually or as a couple, people are able to not only want to know their son or daughter's childcare location and staff inside and out, but make it their business as well! 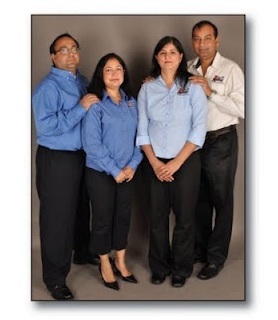 Pramod and Ravinder Gaud and Neeraj and Bala Sahejpal opened their Kiddie Academy franchise in April 2006 at 521 West Capital Expressway, San Jose, California, while in their early 30's. Though the Kiddie Academy brand was new to the area, the Gauds and Sahejpals succeeded in building bonds in the community and setting themselves apart from local competitors. Charged by their success, the Sahejpals acquired another academy, located at 205 E. Middlefield Road in Mountain View, California. Background: With a background in early childhood education, Ravinder began looking at the opportunity to start her own child care business. After she and her husband Pramod decided to explore franchising as opposed to a home-based, independent business, they soon discovered Kiddie Academy. Pramod and Ravinder asked their good friends, Neeraj and Bala to join them in their business venture. Having a background in business and marketing, Neeraj saw it as a terrific investment and was interested in the business endeavor. Bala, who has a Master's degree in Computer Applications, was pregnant with the couple's second child and was excited for the opportunity for her children to be able to reap the benefits of quality child care. Goals: The Gauds and Sahejpals are continuing to build momentum at their two locations by focusing on community outreach projects, staff development and emerging trends in technology. They have set these goals in motion by facilitating several fundraising activities to support local causes and opened an academy computer lab featuring eight computers. With enrollment at both their academies growing, plans are in the works to open additional academies in the broader San Jose area. Challenges: The Gauds and Sahejpals found the two biggest challenges to be establishing themselves as a leading child care provider in an area where no other Kiddie Academy locations existed, and learning to balance the day-to-day activities with the responsibility of running a business. Despite those challenges, they have continued to persevere and build enrollments. Results: The couples' commitment to success has resulted in continued enrollments and an established presence within their community. Parents are continually impressed with Kiddie Academy's exceptional curriculum and safety features. The Gauds and Sahejpals find satisfaction in being at their academy and seeing their children attend. They have been dedicated to making their academy a home away from home for not only themselves but the Kiddie Academy families they serve as well. Stay tuned for future posts on more franchisees to see how Kiddie Academy has changes their lives as well! To find out more and see if this opportunity might be right for you, visit the Kiddie Academy Franchise website. I am partnering with Kiddie Academy Franchising to write a series of posts, however, all thoughts and opinions expressed are honest and my own.